Engraved informal 'epitaph' on Philip Audinet, describing his dislike of new engraving techniques. 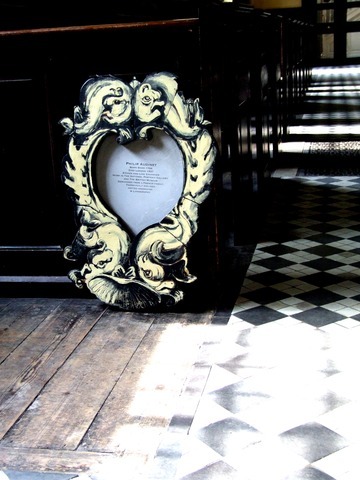 The text on metal sits in a painted wooden frame made from church pews from St Giles in the Fields Church. This is decorated with a fish design taken from a frontispiece from Izaak Walton's book The Compleat Angler, or the Contemplative Man's Recreation, (1653), with engravings by Audinet.